Gravity and chickens are two of our favorite natural forces at Milkwood. 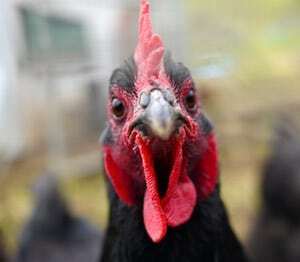 Chickens scratch, poo, give eggs and good company, plus a trillion other benefits. Gravity draws things down. Great it you want stuff to end up down the bottom. Which, in the case of our gravity fed chicken house, we do! For the past 3 years, our chooks have lived in our geodesic chook dome as it chicken-tractored its way slowly across our hillside. The result has been an emerging forest garden, its soil pecked of grass and ready for mulching and planting with edible trees and ground covers each time we moved the dome. For this effort we thank our various chickens. Now, it’s high time to build them a permanent chicken run. Design time! The chicken run we’ve designed is both standard and unusual. 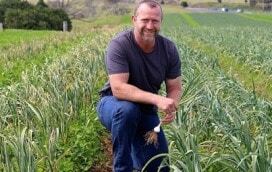 It sits on the edge of our Zone 2, on the outer edge of the upper food forest, directly below the warré beehives and between the old and new top dams. About 20m from our back door. This last parameter was a big one. We want easy and regular access to the manure of this chicken run so that we can use it to increase the fertility of our gardens. We didn’t want ‘cleaning out the chicken house’ to be a major undertaking, rather one that was easy to do on a regular basis. So we decided to let gravity (and the chickens) do the work for us, in true permaculture design style. Enter the Gravity Chicken Run! 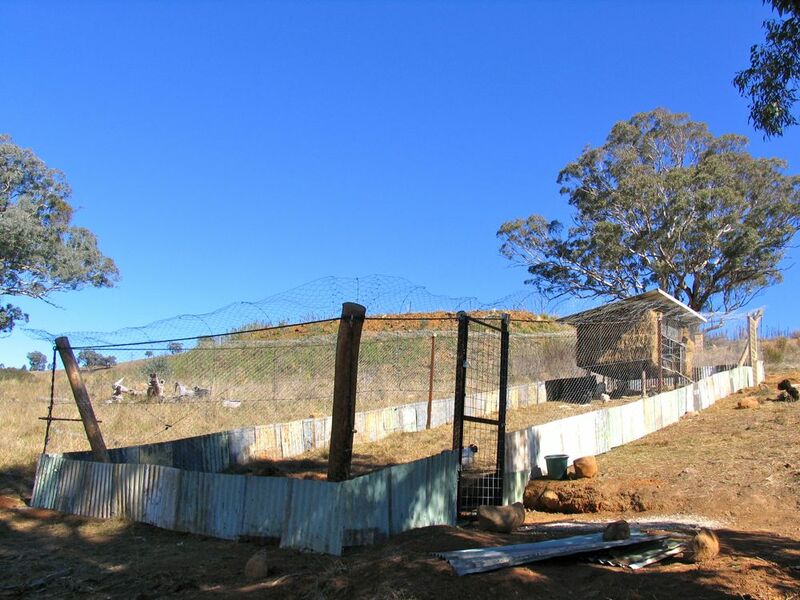 This chicken run design was partly inspired by an old article (which we cannot find) about a down-sloping chicken run with manure collection at the bottom, and also by Joel Salatin’s deep litter systems for his cows and chickens. The chicken run is on a 11º slope (which is a 1:5 slope, or 20%, if you like), running straight uphill. There is a door on the northern side at the top and bottom. The run is 20m long by 5m wide. We will be using gravity and the chicken’s scratching ability to ensure that, over time, everything mobile in that space (mulch, chicken poo, etc) naturally creeps towards the bottom of that slope, at the bottom edge of the chicken run. The time it takes for the organic matter to migrate down the slope is important… it should be long enough for seeds to germinate (generating more feed and ensuring weed free compost) and long enough to build up plenty of soil organisms and insects in the material that makes its way to the bottom. At the bottom of the chicken run is a door, for accessing the composted manure and mulch that makes its way down there over time. Bottom of run, seen from inside during construction. Note flat load for manure transfer out this bottom door. The RawBale chicken house (more on that shortly) is up the top. Everything inside the chicken run (the chicken house, the feeding stations) is elevated and allows for material to pass by and downhill. So inputs go in the top, are processed by the chickens, and exit down the bottom thanks to gravity. The walls are made of chicken wire, with a skirt of old tin. This tin skirt gives the chickens some immediate wind protection, and also makes it harder for foxes to see the chickens. 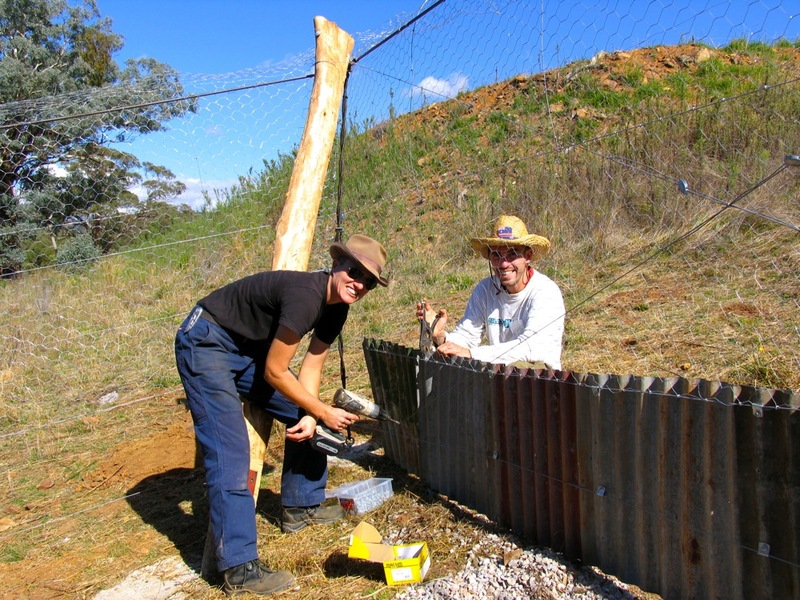 We’ve also installed a ‘fox wire’ – a single strand of plain fencing wire around the perimeter 150mm out from the fence, on the ground and under tension, which according to local lore should help. 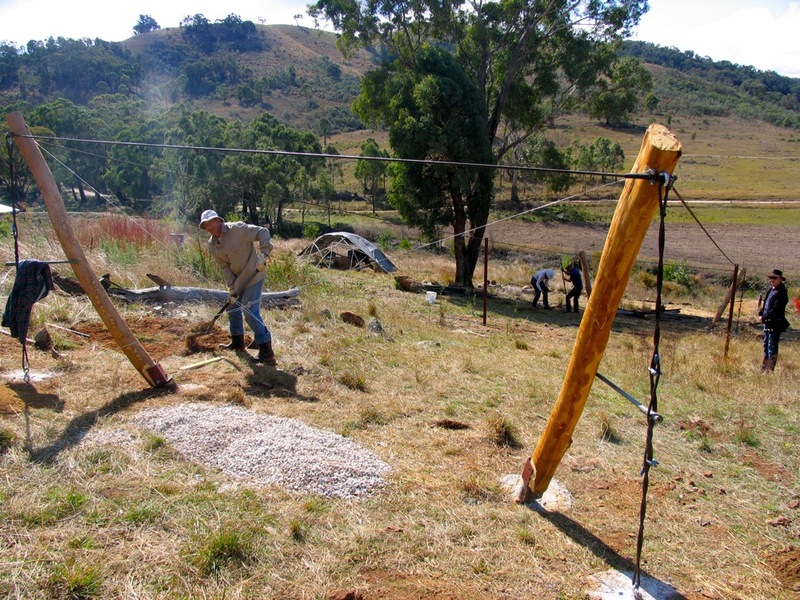 The corner posts are angled bush poles that are under tension thanks to the cable running between them (forming the top edge of the walls), and the cable running from their tops down to the ground. By using tension as a major force in this design, we’ve been able to use just four bush poles, even though the long sides of the run are 2om. Because we live in termite country, we wanted to minimize the wood used in this structure, as we didn’t want termite-proofed (read: toxic) wood near our food forest, or near our chickens. And by raising the poles above the ground, the chickens should take care of termites as they make their way upwards to our poles. We hope. It’s worth a try! A bit of extra engineering and thinking at the start should now yield a structure that is stable for a long time while using materials that are economical to source, mostly recycled and safe for our chickens, our family and our land. The Gravity Chicken run under construction, seen from the north side. 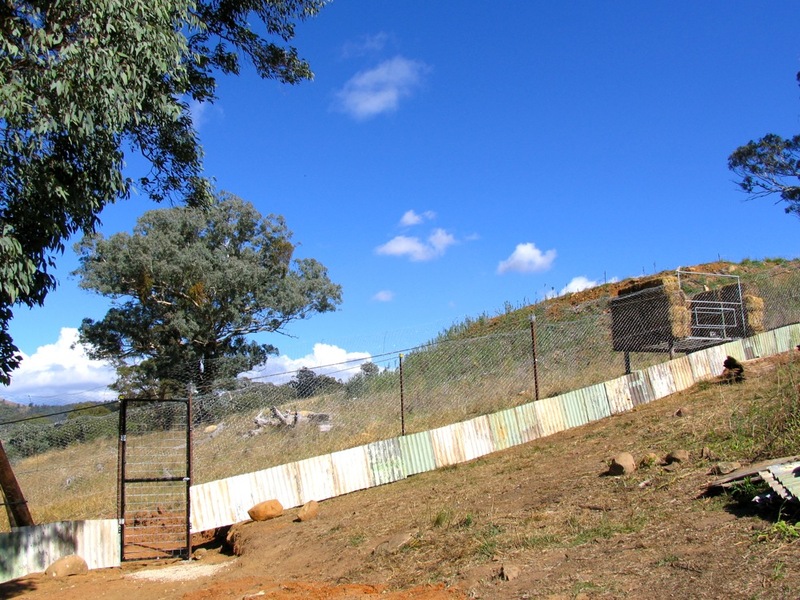 Shelter for the chickens, beyond their RawBale Chicken House, will be the next priority. Once winter takes hold we will be transplanting a 5 year old black mulberry tree to the center of the chicken run, which will provide summer shade and lots of mulberries for the chickens. We’ll follow that up with strategic plantings of tagasate (protein-rich edible leaves and bee fodder) lombardy poplars (edible leaves, fast growing) and acacias (annual dump of edible seeds) within the chicken run. We’ll also use the external side of the north wall for trellising annual climbers as part of the food forest. We’re pretty pleased with this design. It’s very cost effective and allows us to give our chickens a large run without breaking the bank, and providing for both our, and the chickens, needs. Hooray for good design and gravity. At time of writing the whole setup is nearly finished – I shall report back once it’s all done and dusted. Many thanks to Milkwood Interns Kade Smith, Christian Tyler, Amelie Bischof and Belinda Joy-Sheekey and also to Wwoofers Christian Horn and David Williamson for their input and energy. Thanks also to Shane Mills for being a general legend. Compost. 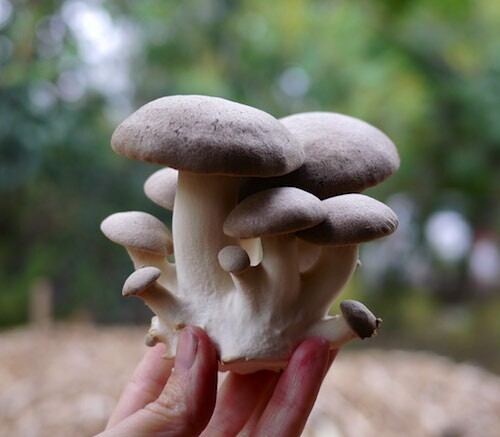 It brings health and diversity to your soil, holds moist . . I like the idea of “rawbale” – I’ve not come across that before. Do you just need a covering roof to keep it dry or are there other design requirements for its use? 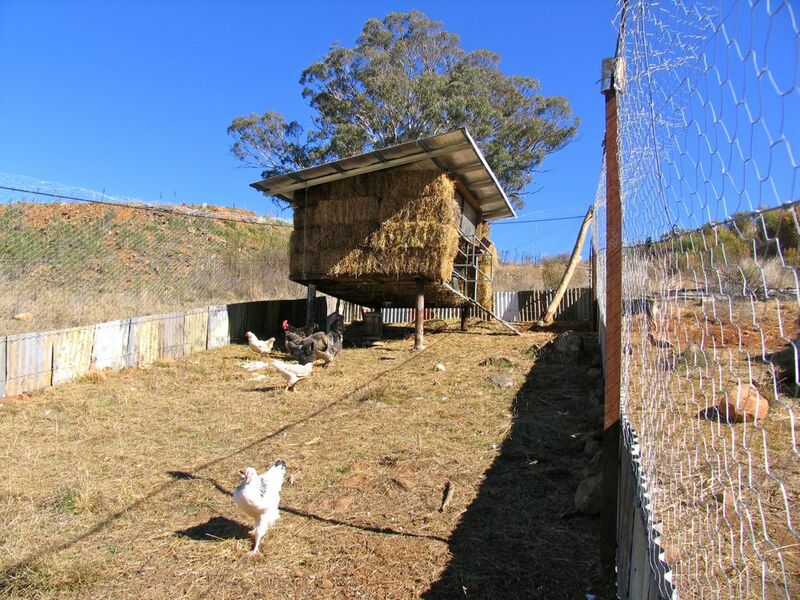 Full explanation of Rawbale chicken house coming right up (i think i coined the term, but i could be wrong) – and yes it has a roof! Wow, that looks fantastic! Great job. I’m interested in whether you will do anything to stop wild birds “sharing” your chickens’ feed via the open top. I found I had to net the top of my run to keep them out. I also had a problem with crows stealing eggs and hawks stealing baby chicks, both of which were solved by the top netting. Hey Darren, hmm. That’s a possibility we may have to look into, but we’ll see how it goes and report back? Hi Kirsten and Nick, I think the article you can’t find may have been my “Fenced In” one in Organic Gardener in Spring 2001. It is so good to see you elaborating and improving on the design! The chook dome and now the gravity chook run! Chook domes served me very well for about 15 years, then I moved to a gravity system – inputs in at the top, chook processed and removed as compost at the bottom. Sadly that didn’t last as long. The thing about exponential growth is how fast it goes once it gets going, and our wildlife population is in exponential growth. As any good permaculturist should have predicted (!! ), as the system has headed towards its stable peak, the bigger predators have moved in – big carpet snakes, wedge-tailed eagles, hawks, powerful owls, even (happily) quolls, (along with foxes, cats, and wild dogs). This is a good thing in ecological terms, but it has challenges as far as keeping chooks are concerned. My system is now moving on again, to the next design. I hope though that your gravity system lasts for a decade or so, before your wildlife catches up. Hi guys. Interesting set up and I’ll be keen to see how it goes over time. When we did our ‘rawbale’ garden bed, we found the bales degraded quite quickly (good but not so good at the same time) so they needed replacing more often than I was hoping for. Wondering what your thoughts are on your design/how you’ll go with that? 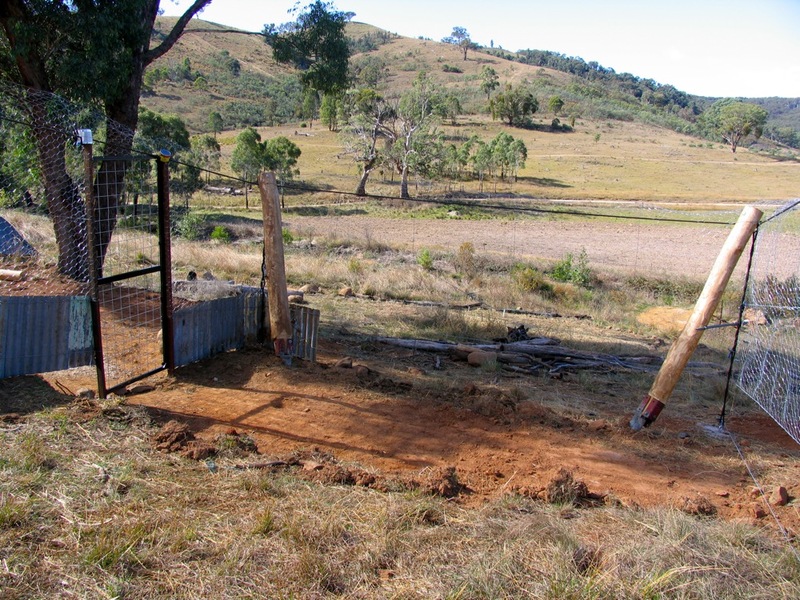 Also does the tin go into the ground to stop predators digging underneath the fence? I know my Nanna has hers set up this way (station country). Good luck and here’s to happy chooks! the tin just goes to ground level (and has rocks on the inside to prevent it moving and the foxwire (see post) outside – apparently stops foxes digging – we’ve been assured this will work! You might want to include some perennial herbal medication growing along the outside of the fence where there is a nutrient and water over flow from the system. These might include Tansy, Rue, Comfrey, Dandelions, Garlic, perennial leeks, er probably anything that produces prolific leaves really as long as its not the only greens they get they can self medicate effectively. Might be nice to get some form of rapid growing trellised greens (annuals) in there as well unless you plan to section some off the raise green feed in lots. The trellised green (bases protected) could include nasturtiums, chokos, chilacayote etc. Great ideas and keep up the good work Milkwooders. Moringa oleifera (Drumstick tree, Miracle Tree). The whole plant – leaves, roots, flowers, seeds is edible & also has medicinal uses. Grown in India & Africa – drought tolerant. 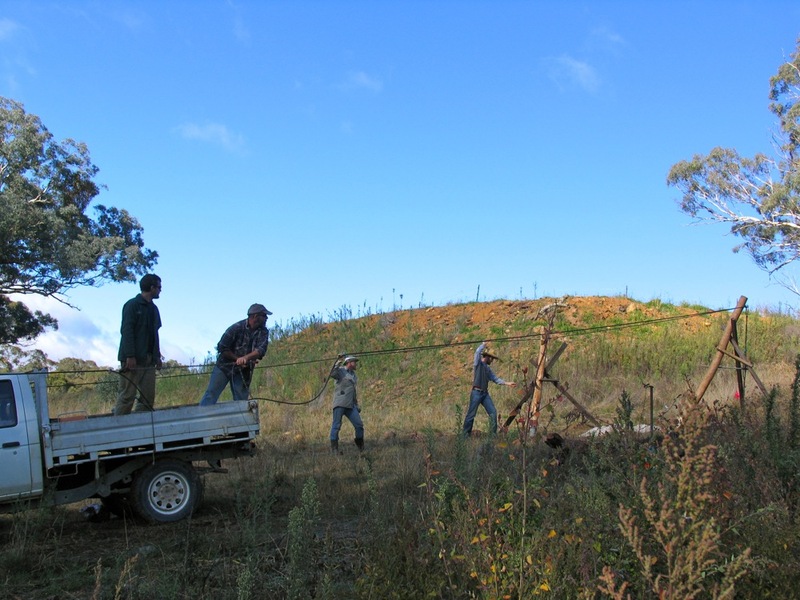 I also plant lots of wormwood around the chook house – deters lice, smells nice (interesting ) too. V. easy to grow from heel cuttings. nice one – thanks Jenny! wild cherry trees, figs, nut trees (almond), olive trees. Comfrey, lots of comfrey. Some acacia, maybe a willow too. You would need some form of drip irrigation to establish the trees properly perhaps. In the photo, you can also see the cover net I was talking about :-). Nice one – cheers Darren! I was thinking about the net if you had to bird net the whole top at some stage, you could have a saggy net that acted as a trellis for edible greens, when you are not in there you have a pulley or some system that lets it sag down in the centre for the chooks to reach, if you need to go in you have a lever/prop or preferably pulley to raise the mesh/trellis so you can then walk underneath. Hehe just a thought though probably lots of good reason why it might not work. now that does sound fancy! 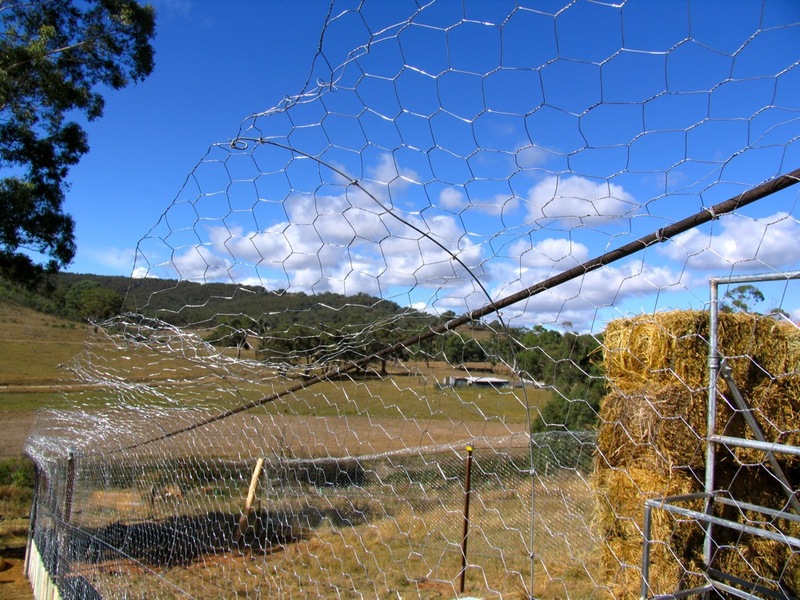 I have had sucess keeping foxes out of pens with electric fencing – one wire about 15-20cm off the ground and about the same out from the fence, and another wire up at the top (or halfway up). Great to see the roof on. How are the baby chicks going? I’ve had great success with pigeon peas and chickens, although the foliage is not a direct food source. The leaves drop quite regularly, we even prune them back once a year and mulch other fruit trees. The grubs these trees attract however are gold mines for the chooks. Out of all the mulches our chooks have scratched up, they dedicate most of their time to where pigeon pea leaves have dropped. They also find a great deal of security under the shrubs. I have several dotted around the place, and they use it for cover from ariel preditors. With your mulberry tree, you’ll need to make sure it doesn’t have any large branches, hawkes can get a good perch from. If you dot a few pigeon peas in the yard, you’ll find the chickens will migrate to all of them. Any leaves dropped will go to mulching the mulberry tree, and collect all those juicy grubs under the soil. I tried to grow some tagasaste but the native animals ate those pretty quickly. The pigeon peas worked really well for my dry (at the time of planting) and nutrient starved soils though. In just a few years, the soil directly underneath these shrubs are incredibly rich. These plants are an absolute must for chicken security and nutrient enrichment of the soil. I wouldn’t be without them. I spent 5 plus years in the central west, and I found out the hard way- arriving in the morn to dead chickens that any hole,,,even one you can fit your fist through ,,, is big enough for the cats or foxes to enter. I may be wrong ( its hard to tell from the pics,,,but your door looks like 4 inch by 4 inch reinforcing mesh,,,,and would have to be covered with chicken wire to prevent cat entry. yes we’re planning to do some rock mulches around the interior plantings. Glad to hear it corroborated by someone! I have fully enclosed my chook run to keep out foxes, kites and crows, and since it is effectively bird netted I thought I would put all my parrot susceptible fruit trees (stone fruit) in the run to protect them from parrots, provide fallen fruit and fruit fly maggots for the chooks and shelter/shade, three birds with one stone fruit if you will! Wormwood is a must, I grow tagasaste as fodder but my chooks don’t seem interested in the leaves, I am sure they will scratch up the seeds when they drop though so might be worth a go anyway, great shade/shelter tree too. My Chooks love a Mexican plant called Imperial Dahlia. It is also known as water pipe and other various names. I found it to be an excellent plant in the drought as it stores water in the canes and it is easy to manage. I just pluck off the branches as they grow. I found placing a trunk into the ground bolt upright was better than laying it down. The cooks dig it up and the ground level shoots never get a chance to start. The cuttings need to be over a metre tall for success. My girls can jump. They provide wonderful shade too. Bunnies love it too and the Quails.